I’m delighted that Mitt Romney is floundering because of the government-run healthcare scheme he imposed on Massachusetts. Not only did it pave the way for Obamacare, but it’s also a good indicator of the awful, statist, big-government policies he would impose on all of us if he ever entered the White House. This Henry Payne cartoon from the Detroit News is a pretty good summary of Mitt’s self-inflicted (and much-deserved) political problem. on March 20, 2016 at 11:27 am What’s the Difference Between Romneycare and Obamacare? Allegedly good effects will not justify. It was intrinsically wrong for the government to force the purchase of this private good. It’s unproven that these allegedly good effects came from your cause-celebre. on May 13, 2011 at 10:55 am Art R.
I predict that the Republican Party establishment will coalesce around Romney. The other would-be candidates have even more flaws than Mitt. 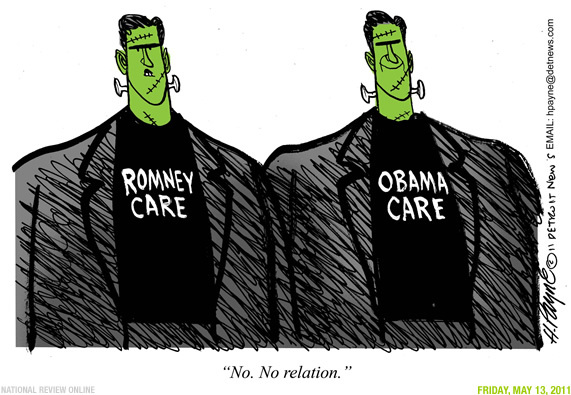 Romney’s defense of his Massachusetts health plan is commendable. Mandating coverage was the only way to ensure that folks who could afford to pay for health insurance but didn’t would pay their fair share and not mooch off those who did pay.